I have anticipated the advent of the new generation of integral-field spectrograph by publishing stellar velocity fields of barred galaxies (Wozniak & Pfenniger 1997). We were able to explain wavy patterns of SB0 rotation curves. In particular, we emphasized the role of retrograde orbits, always present in our models (between 17 and 30% in mass). We also showed that a counter‑rotating stellar component is not always the sign of a past interaction or merging event since some models intrinsically display counter‑rotating regions. Each stationary self‑consistent model used in the above studies has been computed with Schwarzschild’s technique (1979). We greatly improved this computational technique (Wozniak & Pfenniger 1997). We obtained an amazing result with a model that minimizes total |Lz|. Indeed, the distribution function is similar to that obtained with N‑body codes after an evolution of ~5 Gyr. Such similarity could be due to the fact that minimization of |Lz| favors elliptical orbits aligned with the bar. However, this does not explain why the other components, especially the stellar population which crosses the corotation radius, are also present with the same proportions than in N‑body simulations. Chaos properties of our self‑consistent models have been studied using Kolmogorov‑Sinai hKS entropy. We mapped the spatial distribution of hKS that allows separating regions dominated by chaos from those containing essentially regular orbits (Wozniak & Pfenniger 1999). One of our results concerns the model that shares the same distribution function than N‑body simulations. This model shows a peak of chaos between x1 and Lagrangian orbits, a region where strong stellar bars are often more rectangular than elliptical (Athanassoula et al 1990). This emphasizes the role of Lagrangian orbits in the bar morphology. Finally, most models contain semi‑chaotic orbits enclosed inside corotation, which confirms former results (Wozniak 1991, 1994). Figure 1: Spatial distribution of Kolmogorov-Sinai entropy in stationary self‑consistent models (Wozniak & Pfenniger 1999). Weak chaotic regions are blue while strong chaotic regions are yellow. Min (|Lz|) model has a distribution function similar to N‑body models. During the last decade, N‑body simulations, including gas and rudimentary large scale star formation recipes have widely contributed to a better knowledge of the evolution of galaxies along the Hubble sequence. For instance, they proved the role of bars not only on morphological changes but also on star formation rates and spatial distribution of HII regions. However when one compares the results of these N-body simulations with real observations, the M/L ratio is implicitly assumed to be constant over the whole galaxy. This is in complete contradiction with color gradients and could introduce a bias when one uses ‘observational’ tools to determine fundamental parameters like the length of the bar in N-body simulations. 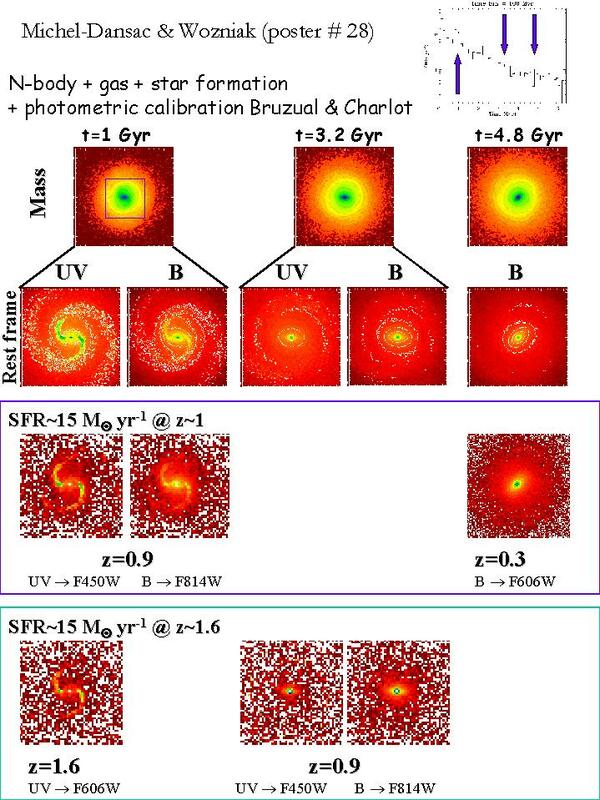 We have thus ‘calibrated’ some typical simulations of disc galaxies (Michel-Dansac & Wozniak 2004). Several luminosity‑weighted observable quantities (e.g. isophotal diameters) can be studied in parallel with dynamical ones (e.g. resonance locations). Coupling of our chemodynamical code (a much more simplified version than the current one) with stellar population synthesis and spectrophotometric evolutionary models (Bruzual & Charlot 1993) has clarified the interplay between dynamics, star formation and observation limits. For barred galaxies, we recently published a dedicated paper (Michel-Dansac & Wozniak 2006). We have applied several observational criteria to determine bar lengths and ellipticities to chemodynamical simulations and compared with the location of resonances or the value of bar strengths determined by gravitational forces. We have shown that the minimum of ellipticity located just outside the bulk of the bar is correlated with corotation whereas the location of the Ultra Harmonic Resonance can be approximated using the end of the position-angle plateau of bar isophotes. We have given evidence that the classification of slow/fast bars, based on the ratio R = RCR/Rbar could increase from 1 (fast bar) to 1.4 (slow bar) just by a change of method. This has dramatic consequence on the debate about the shape and concentration of dark matter halos in barred galaxies. Figure 2: sketch of the photometry calibration of our N‑body + gas + star formation simulations. Figure 3: Example of a calibration of an N‑body + gas + star formation simulation. 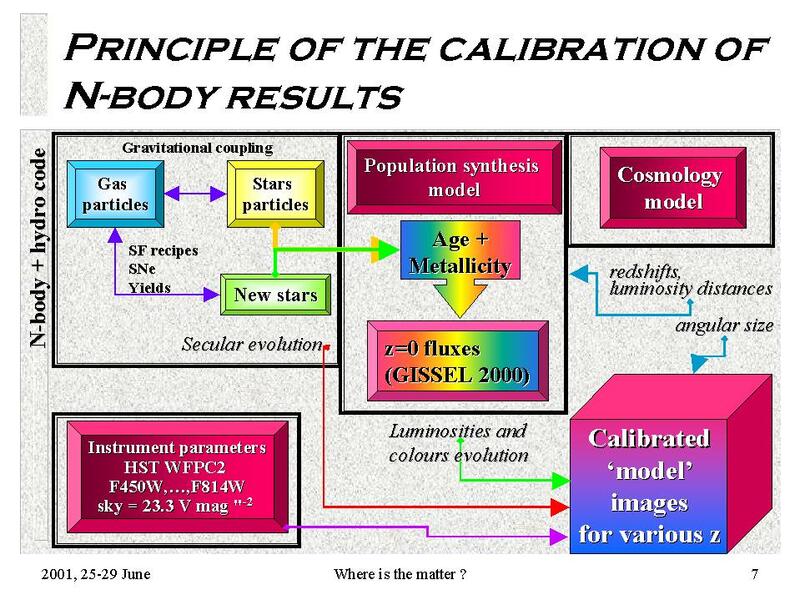 Top frames: mass density evolution and rest frame flux calibration. 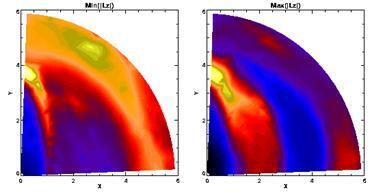 Two bottom frames: simulations of HST images for two different scenarios where the SFR maximum is located at resp. z=1 and 1.6. Cosmological effects (dimming, K‑correction etc.) are taken into account as well as instrumental ones (e.g. WFPC2 noise) (Michel‑Dansac & Wozniak 2001c).